I don't know why, but I've always been bothered by my first review of the encore edition of Magic brownies. I always want to buy this flavor again when I walk by it but I remembered it not being anything special. In my defense I had only been blogging for three months during that first review so I was concerned that maybe I had been a little too harsh. I mean, I love quality black raspberry ice cream, so why wasn't I passionate about this one? 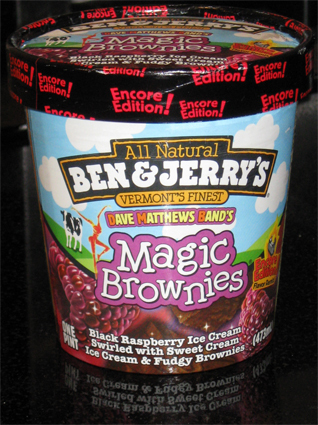 Before we start, how many of you out there had the original magic brownies flavor? 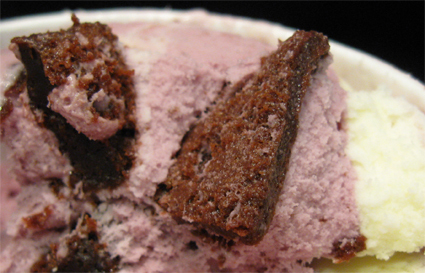 It was vanilla ice cream with fudge brownies & raspberry swirls. 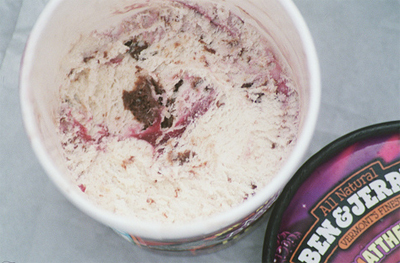 I'll be honest, I didn't have it, but the raspberry swirl sounds tasty if done right, and since this is B&J's, they probably did it right. I had to post this picture too. It certainly looks fairly tasty, though it's hard to tell how big those brownie chunks are. If I had to guess I'd say they might be good sized cube brownies. 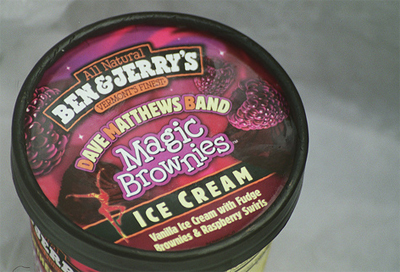 Press releases show this flavor as being announced in May of 2005, and these pictures were taken in early 2007 which would have been the last year for this version of the ice cream. Now my first review was in 2008 when they came out with the Encore Edition flavor remix. 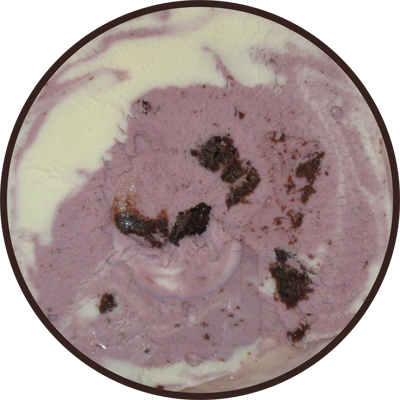 This pint is now black raspberry ice cream swirled with sweet cream ice cream & fudgy brownies. Looks a whole lot different then the original doesn't it? Now this close up is all about showing you just how gigantic these brownie pieces are, and you might think that this would make it the best flavor ever. I mean, how can you argue with a literal slab of brownie in your treat? Well, easy, it's too big. This could easily be 5 or 6 pieces of brownie scattered about, instead it's one big slab. There is the catch phrase "go big or go home" but I'd rather see them spread out, or really not bother at all. Granted if there were no chunks then it wouldn't be a unique Ben & Jerry's flavor anymore would it? Like before, I'm not saying this is a bad flavor. It's excellent quality ice cream, it's tasty, it's just that. It's fine, I just still believe it could be better. Oh well, at least my review has real pictures this time. I can't believe I use to eat all that ice cream without taking pictures! Come back tomorrow, I've got one more container downstairs that can't wait to be cracked open.